'Tis all Eternity has left of Rome! An Essay on Mind E.B.B. And from man's dust to God's divinity? The joyful wreath of the Rome Window is made up of pink roses, laurel and olive leaves, purple berries of the laurel tree, and pale gold and white buds of the olive tree flower. At the bottom of the wreath is a portion of a fallen column, an image taken from an illustration by George Vivian in Views from the Gardens of Rome and Albano (1848). Ruins in the Roman Forum, overgrown with vines, form the central image of the window. The specific ruins are those of the Temples of Saturn and Vespasian, based on a nineteenth-century photograph taken by Robert Macpherson. The bright blue sky denotes a beautiful, clear day in May. Seen in the upper left of the Rome Window is a portion of the magnicent Roman Colosseum (the Flavian Amphitheatre), menationed by both poets in their letters. In later life, Browning enjoyed telling the story of being in a part of men who, after meeting at a restaurant, set off in two carriages to view the Colosseum by moonlight. In the window's lower left is a view, from an early photograph, of the Via Bocca di Leone. A baroque composition in stucco of a Madonna, under a canopy of drapery supported by an angel, is on the corner of the building where the Brownings lived while in Rome. Beneath that is a blue plaque commemorating their stay. A view of the long, sweeping staircase known as the Spanish Steps is the focus of the vignette in the upper right corner. Pink azaleas adorn the way to the lovely French church, the Trinita deil Monti, at the op. The Piazza di Spagna at the base of the steps is very near the street where the Brownings resided in Rome. In the lower right is an image of Trajan's Column (A.D. 113), raised in honor of the Roman emperor Trajan. The stunning stone-carved reliefs winding around the hundred-foot column portray victorious military campaigns and are a significant creation of Roman art. 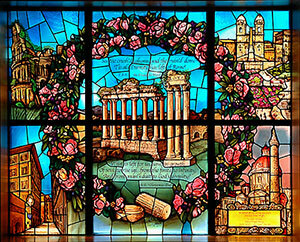 The overall design of the Rome window was largely inspired by the following quotation from On Two Continents: Memories of a Half a Century by Marie Hansen Taylor (1905): "This was May, He who has never spent that exquisite month in Rome knows not how beautiful she is. The gray masonry of the ruins, on which the nimble lizards have hitherto sunner themselves, are covered as if by enchantment with green blossoming vines, the villas are gardens of roses in which nightingales sing, luxuriant vegetation is everywhere...."